In a certain town, which for many reasons it will be prudent to refrain from mentioning, there is one building anciently common to most towns, great or small: the workhouse. And in this workhouse was born, on a day and date which I need not trouble myself to repeat, a boy who, according to fortune-tellers and oracles alike, would be our true defender, the protector who would one day close hell's mouth forever - ending the darkness that had sunk deep into the heart of the kingdom. FLESH, the woe-begotten moaned at Oliver, baring teeth which were ragged and black. “FLESH,” came another moan, and he turned to see two more woe-begottens behind. They began to shuffle towards him, barefoot – toes blue from cold, arms outstretched. The world according to Oliver Twisted is simple. Vampyres feed on the defenceless. Orphans are sacrificed to hungry gods. And if a woe-begotten catches your scent it will hunt you for ever. When a talking corpse reveals that Oliver will find his destiny in London, he sets out to seek the truth. Even if it means losing his soul. I wonder what Charles Dickens would say if he knew Oliver Twist now lived in a world where vampires freely sucked the blood from the poor orphans! 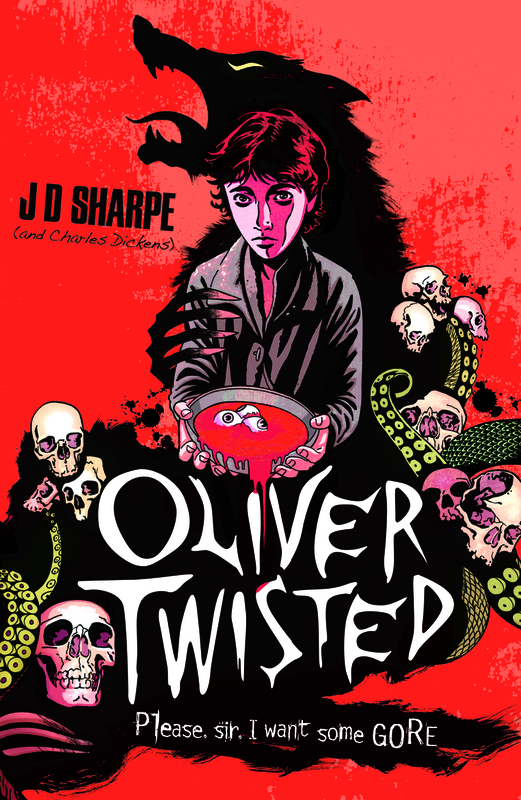 The original Oliver Twist was always such a dark tale anyway, so I was rather intrigued to discover that JD Sharpe had made it even darker. 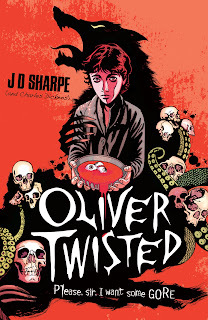 Oliver Twisted is gloriously gory and I loved every minute of it. A rich atmospheric read, that will bring a classic tale into the hands of today's teenagers. I love how the author has developed the characters. The real essence of each character that Charles Dickens created is still there, but the author has given them a malevolent makeover that really captures your imagination. The connection between Bill Sikes and Bullseye completely won me over. I was so impressed with their past history. I loved Oliver - his constant battle to discover who he really should be broke my heart; I wanted to reach out and comfort him. Dodge was just fabulous too - definitely a character you would want on your side. The book follows a similar path as the original, but JD Sharpe has definitely made it her own. with the addition of soul stealers, woe begottens (zombies) and vampyres. Everyone know now that I am not a great fan of zombies, but these ones actually had feelings and I felt sorry for them. The story may be Dickens, but the voice is definitely JD Sharpe's! I can't wait to see what book will be next! Not too sure if I like the idea of all these classics being retold as vampire/zombie stories. I've never read the original, but this sounds really fun. I enjoy these type of remakes. Oliver Twist holds such a special place in my heart, I'm not sure I'd enjoy this one. I love the sound of this book - I will be buying a copy soon! I cant wait to get my hands on a copy of this book, it sounds amazing and Im glad you enjoyed it!